Appearing together in four films, Frances Gifford and James Craig first shared screen credits and some scenes in Marriage Is a Private Affair (1944), playing characters who also share mutual friends in the form of Lana Turner and John Hodiak, but do not apparently share each other. 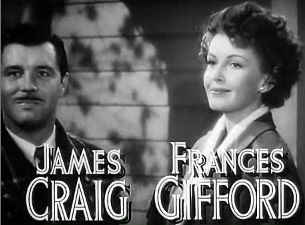 Starting with She Went to the Races (1945), romantic, even comedic, possibilities begin to evolve in the teaming of the characters Ms. Gifford and Mr. Craig portray. The next outing — Our Vines Have Tender Grapes (1945) — came on the heels of She Went to the Races, but relegated the two actors to largely secondary roles behind the very much younger and much more adept at scene-stealing Margaret O’Brien and Jackie “Butch” Jenkins. Little Mr. Jim (1946) presented a very loving married couple raising a very lovable and titular character portrayed by that same Tender Grapes scene stealer Jackie “Butch” Jenkins. Frances, whose brother is Frank Gifford of Monday Night Football fame, and whose movie career always seemed to suffer from too many scenes in the shadow of the likes of a Margaret O’Brien or a Jackie “Butch” Jenkins, suffered a near-fatal head injury in an automobile accident in 1948 and devoted many subsequent years in other kinds of shadows while she worked to regain her health (which she eventually did). Alas, her movie career came to a close in 1953 with Sky Commando, opposite a young Mike “Touch” Connors, who found a spotlight in his role as Mannix on TV.